A review of the Digital Analytics Program (DAP) data confirms what many are already saying: Content is being viewed on mobile devices more than ever before, and the percentage of sessions via mobile devices is growing. 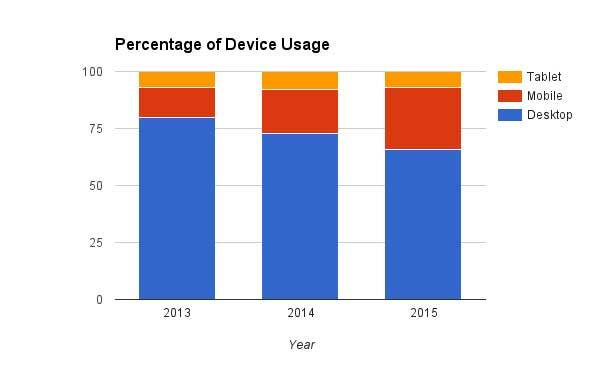 Within the last year, we saw the combined mobile and tablet percentage exceed one-third of all sessions. A third of the time, content on DAP-participating websites is viewed via mobile or tablet, which has significant implications for Web design, responsiveness and mobile websites. Brands and DevicesNote: In an effort to make things simpler, the term “mobile” is used in the following paragraphs to refer to both handheld mobile devices and tablets. If we look at mobile sessions on their own (not compared to desktop), Apple devices account for almost half of the total mobile share in 2015. The iPhone (34% of mobile sessions) and the iPad (15%) combine to make Apple the most used mobile brand. 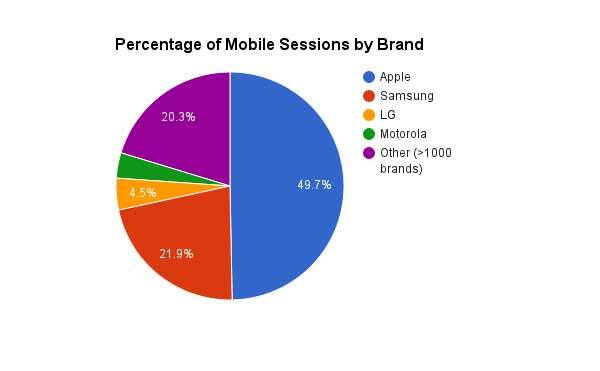 That said, sessions viewed on one of the many versions of the Samsung Galaxy add up to make it the number two device, contributing about 21% of the share of total mobile sessions. As evidenced in the chart below, after that, there’s quite a dropoff. LG and Motorola represent about 8% of mobile sessions combined; HTC, Sony, Nokia and Amazon all have slightly over 1% each (not shown in chart). Another interesting fact: In a 30-day sample, over 1,000 different mobile brands and over 9,000 distinct mobile devices were used to access DAP-participating websites. Last week, we did some analysis on overall browser usage. But one needs to look a bit deeper into the DAP data to understand the mobile browser trends. 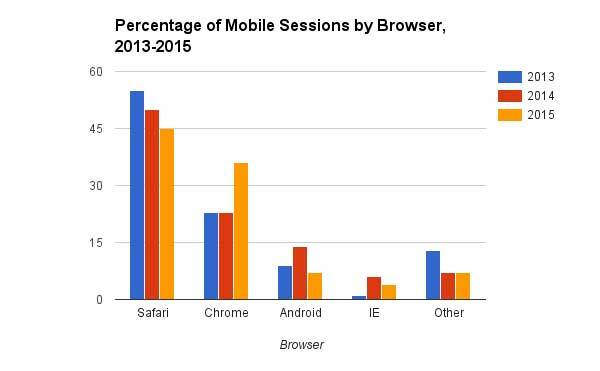 Since some browsers are mobile-specific (like Android) and others are not (like Safari), we broke down the browser usage for mobile sessions (includes both mobile and tablet). Safari’s share of the mobile pie has decreased each year, but retains the title of most-used browser on mobile. Also, mobile sessions still account for 77% of Safari’s total sessions in 2015—it is surely a mobile browser first and foremost. Chrome now has a 36% share of mobile sessions, possibly because of the success of the Samsung Galaxy. Almost half of all Chrome mobile sessions happen on a Samsung device. The browser with the highest percentage of mobile sessions in the “other” category in 2015 is “Safari (in-app)” (3.2%), which accounts for sessions within mobile apps that have an internal browser, like Facebook. The “other” category also includes browsers like Opera Mini (1.5% of mobile in 2015), Amazon Silk (1%), Firefox (.5%) and Blackberry (<.5%), among others. In sum, one-in-three visits to federal websites are on a mobile device (including tablet) and that number is increasing. The majority of mobile traffic is coming from either an Apple or Samsung device and 80% of the sessions come via either Safari or Chrome browsers. We hope this information proves useful as you think about the maintenance, design and creation of federal sites!